The hills around Uasin Gishu and Elgeyo Marakwet will reverberate with the roar of turbo-charged and normally-aspirated machines when the third round of the 2017 Kenya National Rally Championship gets underway in Eldoret Saturday morning. The 2017 Raiply Eldoret Rally will revisit the high-altitude terrain used during last year's edition. But the designated spectator stage at Chemweno farm will be run in opposite direction, according to Clerk of the Course Sinder Sudle. The event will be flagged off at Sirikwa Hotel from 7am onwards on Saturday after which rally traffic will tackle a 21.75Km transport road section through to the first stage at Sergoit. The technical and ceremonial finish will be centered at Chemweno Farm, which is also the venue for the Service Park and Rally Headquarters. Scrutineering will take place on Friday at Sirikwa. “Due to the safely aspect, spectators and the service crew are being advised to use the route provided to get to the service. Both the rally cars and spectators will use Eldoret-Iten road up till Sergoit junction. They will all turn left at Moiben Road and do another 7km to the turn off Sergoit. At Sergoit crews will turn right to the first stage while spectators and the service crew will carry on straight towards Moiben for approximately 8km and turn right into Chemweno Farm,” said Sudle. “The 11.40km Sergoit stage (CS1), will be run once and is a very fast on its first 7kms. The 5.02Km Chemweno spectator stage is the same as last year but will be run in opposite direction. Farm –Chebiemit (33.83km) is also the same as last year but slightly longer by 5km. The stage is very fast and demanding. Salabin Forest is the same as last year but due to the current wet conditions, the stage could turn out to be muddy though passable. This year’s rally has attracted all the top drivers including the Flying Finn Tapio Laukkanen, leader Ian Duncan, Cartl Flash Tundo and Baldev Chager among others. The KNRC Two Wheel Drive class has attracted the likes of Leonardo Varere and Sammy Nyorri while defending S Class Champion Chandrakhant Chandu Devji is back after skipping the first two rallies. 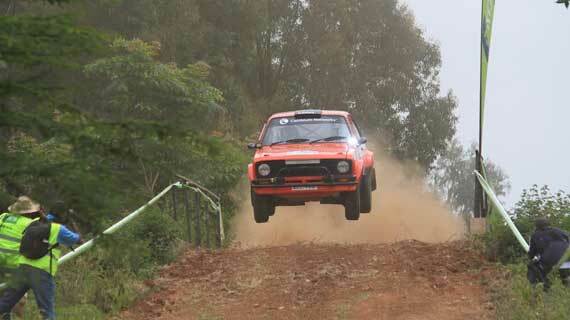 Western Kenya Motor Club (WKMC) are the organizers of Eldoret Rally.